As a native brooklynite whose parents moved to the city's largest borough in the seventies, the concept of "literally being crazy" to Evan Z. Crane has always been relative. Though he was educated as a fine artist, chance encounters with rough joinery in the raw materials he used served as an introduction to what would eventually become his central focus, furniture. Today Crane's designs represent the totality of his experiences in a formal and material style that imbues individuality into every piece. You were born and raised in Brooklyn – what are your thoughts on how the borough has evolved over the years and where it’s at today? Man that’s a tough question. Brooklyn has changed a lot since I was a kid, but I’m sure that the same could be said by the generation prior to mine as well. My Parents were the first of their friends to move to Brooklyn from Manhattan in the 70’s and everybody thought they had literally lost their minds. I have to imagine that their first neighbors must have had similar reactions to the residents of Bedford Stuyvesant when people started buying out there. A lot of it is relative, it's just hard to see it in the moment and I can't even say that the most obvious change is cost of living. It is, but that again could be echoed by previous generations. I think that the exponential growth that has occurred is the real key difference in dictating the sheer speed in which a neighborhood can go from “bad” to “good”. A lot of it is just a change in perception and doesn't reflect what is actually happening in the neighborhood. Anyone who lived in Williamsburg or Bushwick in the first decade of the 2000’s knows exactly what I’m talking about, where your rent goes up but crime doesn’t go down. As a designer, today's Brooklyn is a real double-edged sword. On the one hand you have the kind of economy that can really support independent studios. On the other hand, it is so hard to find the space, time and money to develop your products thoroughly. I can say first hand that you make different design decisions when you feel pressed for time and money. You can have an idea, start developing it and say, “this isn't worth it” or “it’s going to take too much time, money, etc.” You can end up picking an easier design solution instead of going with your gut. That’s Brooklyn now, there is no fooling around anymore, it puts your passion to the ultimate test. Coming from a fine art and sculpture background how did you eventually make your way to furniture design? The shift started toward the end of college, this would be in the early 2000’s. I was doing large wooden carvings made from recycled NYC timbers. They were the biggest pieces of wood I could get at the time for dirt cheap. The timbers would come with mortises and tenons cut in them, periodically there would be old school carpenter symbols like runes scratched in them, evidence of decades old woodworking. The raw timbers were very intriguing, in retrospect probably more interesting than any of the finished sculptures. Someone gave me a book about Japanese joinery and I dove into the subject. The complex joints really blew my mind, functional sculpture. I started to make simple furniture, it was a totally different experience. I was using all the same principles of art; form, proportion, composition, materials but they directly related to a physical human experience. I think realizing the connection that people could have with furniture is what sealed the deal for me. The daily physical contact could make the users experience intimate and powerful — like a relic or artifact that is activated by touch. I think it’s fair to say that you have a singular design sensibility. What / whom would you say are your design influences. I have two main influences that I draw from. First would be art, architecture and their collective history. I came to design through sculpture and painting, figures like Henry Moore, Alexander Calder, Louise bourgeois, Isamu Noguchi, Constantine Brancusi had tremendous influence on me as a designer and maker. Through them and countless others I fell in love with the physical act of making three dimensional objects. I also became hard wired to elicit or imbue individual personality into every piece I make regardless of time or budget. The other more obscure influence I can only describe as unintentional design. This is the sort of thing that exists all around us but might not be easily attributed to an individual. Objects, details, and structures whose form comes from function first, but then develops personality through the realization of universal geometry. An expressway overpass, children’s playground equipment, a structural I-Beam assembly are all good examples of unintentional design. Materials play a huge role in your designs and are often used in surprising combinations. In terms of how you approach materials would you say that you tend to find them or vice versa? It's a combination of the two. In matters of design I can't stay satisfied for long with any one thing. Sometimes materials are the very inspiration for a piece or number of pieces as with the creature credenza and fuzzy captains chair. Other times they can open up whole new roads and avenues in one's work. 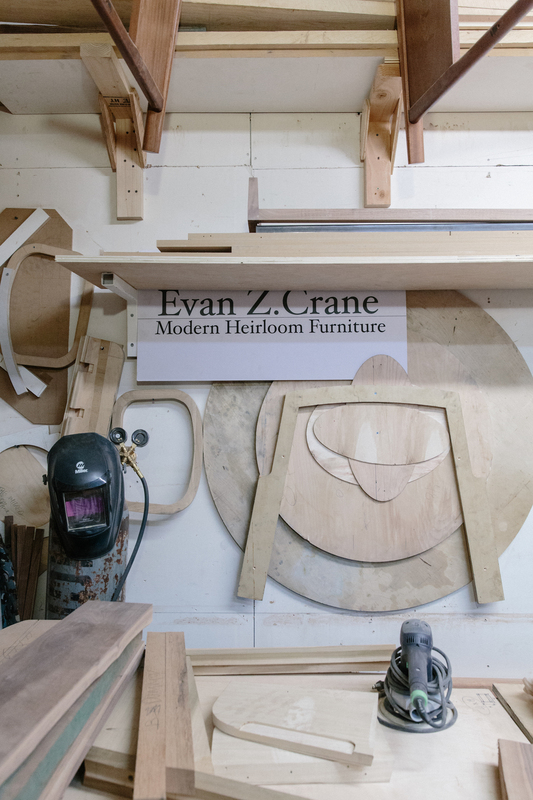 When I first started making furniture, I solved all my design problems with wood. It was extremely frustrating for me at the time. I started doing architectural metal work and my mind was blown. Metal was capable of doing things physically unachievable in wood. There was a great sense of freedom in figuring that out. What designs and/or projects are you most looking forward to in the coming year? May is right around the corner, and I'm pretty excited about the new additions to my collection. I debuting a couch and a club chair along with some other pieces. I feel like every year I move more and more toward big comfy seating. This year I've been focusing a lot more than ever on metalwork and upholstery with the wood components taking a more subdued roll. This is pretty much the opposite ofhow I made furniture in the past. I still don't know how it will all turn out, to me that's the best part of making things.